I had been on the lookout for a dresser that I could repurpose as a TV stand for some time. Size was definitely a consideration and so was storage - in addition to space for those ever-lovin' components that we've acquired. I finally found one that met all of my specs - and it was $20.00. It did come with all of the hardware but I had removed it before I remembered to take a photo! The top was sanded and stained (Valspar Dark Walnut) and the rest was painted with HM chalk paint using Behr Chipotle Paste & My Savvy Sister Chalk Paint Dust. I opted to remove the first large drawer to make a shelf for TV components and use the rest for storage. I kept the original hardware, just painted it flat black. This is what I was looking for over three years ago when I got my first flat screen TV but I couldn't find what I was looking for to repurpose, so I settled for a piece as a temporary solution. It was Made in China out of pressboard. It looked "okay" but it really was a piece of junk - so glad it's outta here! I worked on another small piece the last couple of days. It has three drawers so I think it is more of a small cabinet than a table, though it could be used as an end table or a nightstand. I've done a couple of colorful pieces lately and this one was already "colorful" when I found it! But... those "colors" weren't exactly what I had in mind, so after cleaning it, and doing some minor repairs, I painted it! I think I've mentioned before that I upcycle a lot of small tables - end tables, side tables, accent tables, nightstands. Candidates are fairly easy to find and even if they need some structural work, they're usually quick projects. Another big plus is they sell - and that's always a good thing! This one was in fairly good shape but desperately in need of a facelift. The photo doesn't show the true colors well - the legs and shelf are black (BM's Twilight Zone) and the top and apron are what I would call a sage green (Behr's Green Siding). This one is very old & though it may not look too bad from the first angle, the second angle shows that the bottom shelf definitely needed some help and then... there were the two legs that had dry rot on the bottom. Ugh! Looked like something had been chewing on them!! Both tables needed a serious cleaning and some repairs with wood filler, then gluing & clamping before the painting began. Painted with HM chalk paint using Behr Fresh Pineapple & Savvy Sisters Chalk Paint Dust, then distressed and waxed with Fiddes Antique Brown. The small, detailed inset on the front of the table was stripped of two layers of paint then stained with Minwax Antique Walnut. making a statement in red! This was also painted with HM chalk paint made with BM Ruby Red & Savvy Sisters Chalk Paint Dust, then distressed and waxed with Fiddes Rugger Brown to deepen the color. (Those irregular dark marks on the top are just the shadow from the tree). 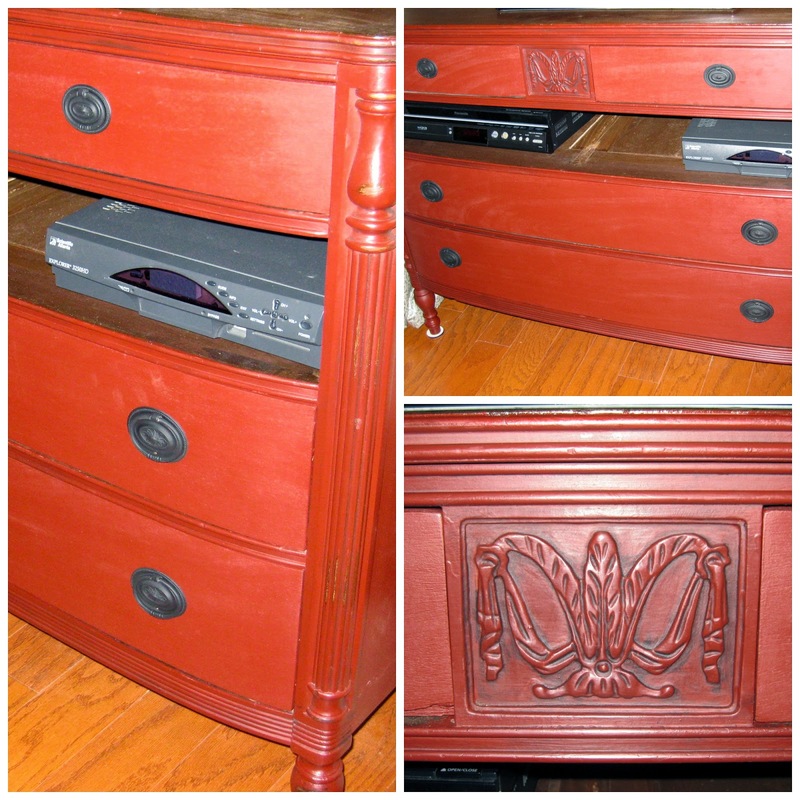 The small drawer is stained with Minwax Puritan Pine and the little wood knob matches the red table. Now, on to the next project(s)! I love to tackle a retro piece once in a while. This one was sturdy but the finish was worn and it was looking very tired. Here it is in black, which is always current, with a graphic added to each of the shelves.